The Ngorongoro Conservation Area (NCA) covers some 8,300 square kilometres. It boasts the finest blend of landscapes, wildlife, people and archaeological sites in Africa. It is also a pioneering experiment in multiple land use. The concept of multiple land use in conservation perspective is a deviation from a traditional approach of regarding conservation as complete absenteeism of human interference. Selous contains about one third of all the wild dogs (often called painted dogs), in the world. Their need to roam vast areas and their formidable hunting skills have caused many to be shot by farmers, but here in Selous they have boundless woodlands and savannahs in which to roam. Along the Rufiji River, an array of grazing antelopes, crocodiles and hippos are commonly seen as well as black and white colobus monkeys in the riverine forests. During the dry season from June to October, the concentration of animals along the river is astonishing. Linked to the Rufii is Lake Tagalala where waterbuck, reedbuck and bushbuck gather at the water's edge. Magnificent sickle-horned sable and curly-horned greater kudu tend to keep to the longer grass and wooded shrubby areas. In the dry season an ancient migration of elephants takes place between the Selous and Mozambique's Niassa Game Reserves. This is one of the largest natural trans-boundary eco-systems in Africa and at the last consensus it was estimated that 64,400 elephants roam the two parks, with 84% on the Tanzanian side. Fierce tiger fish and smooth slippery vandu catfish are caught in the rivers. The latter is equipped with primitive lungs allowing it to cross land for short distance in an attempt to find water water during the dry season. Dry Season: The dry season sets in during June to November and is the best time for game viewing along the rivers. Elephants come out of the bush at that time and predators are more commonly seen. Rainy Season: January to April is wonderful for birdlife ad lush scenery but many roads become impassable after heavy rains. December to February is still good for game viewing but can be rather hot and humid. The safari lodges are usually closed from March to May. This massive stretch of land is the second largest game reserve in Africa. At over 21,000 miles² (55,000 km²) it is almost four times the size of the Serengeti. The only human habitations allowed are limited tourist facilities. Road access is only possible during the dry season and most visitors fly in from Dar es Salaam by charter aircraft. 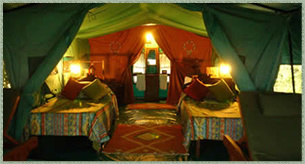 Safari lodges are restricted to the top 20% of the reserve.